We've got a simply spectacular episode of Failcast, nice and late the way you're used to it - this should have been up last Thursday, after all. To celebrate Dtoid's third anniversary, we took a bunch of community questions about the event and had an awesome discussion. That is, that's what would have happened if we didn't get totally smashed by the end of the podcast, so consider this another excuse for you to get drunk before listening to our show. This week's community guest is Unstoppablejuggernaut, who surprisingly doesn't drink during the show and thankfully doesn't make any spelling mistakes. Host Yashoki also doesn't drink, but King3vbo, Hitogoroshi, and Necros are all totally gone by the end of the show, which makes for many entertaining bits. 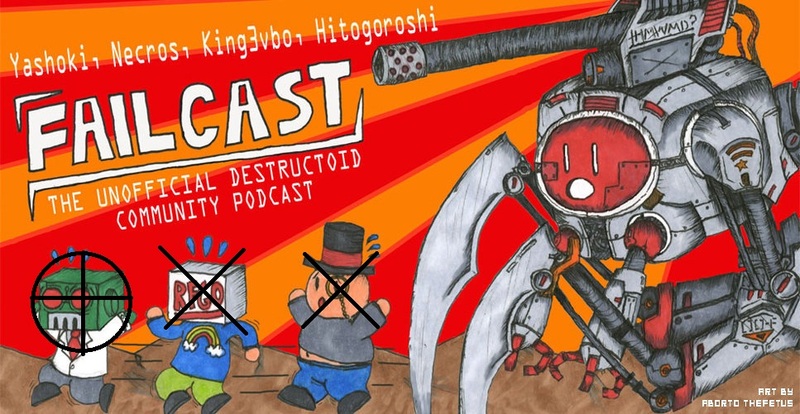 A small note: Failcast is taking a short, two-week break to relax and recharge, so there will be no show for this week (this episode doesn't count) nor the week after. Then again, you might stop listening after this show, so we wouldn't be surprised. 27:30 - Contest: map finding time!